The importance of checking sewer lines is one of the most important steps when purchasing a property. DIAL 613 571 6881 Today! No corrode sewer lines are essentially treated cardboard that could cost you thousands of dollars to replace. Tree roots through sewer lines, cracked and broken clay pipes, and just poorly installed lateral lines can cost you thousands of dollars in costly repairs. Even brand new homes can have sewer lines installed improperly. 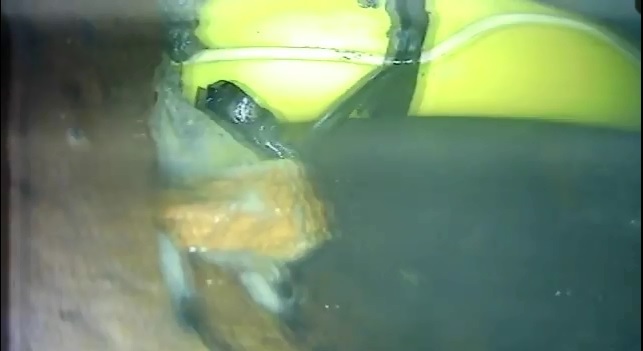 In the video above you can see an actual GAS LINE that was drilled through a water line here in Cornwall. The yellow line is a gas line through a sewer line with electronic location cable attached. If you had a plumber use an electric snake to unclog a line you could end up blowing your building sky high! If you rented the tool yourself you could still tear open a gas line. BOOM! Which is why it’s critical to use a specialized professional like Wyatt Walsh of Walsh Pressure Cleaning. From Brockville to the Quebec Border, and Alexandria, Walsh Pressure Cleaning comes to your property whether it be to clear a drain or video inspect your lines before you buy. They also pressure clean buildings and commercial vehicles as well as de icing of water & sewer lines. From as little as $150 dollars isn’t your peace of mind worth it compared to a few other firms that charge as much as 5 times more for the exact same service or worse? If a plumber is going to open your sewer line without doing a locate for gas lines do you really want him doing the job? 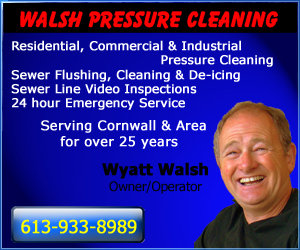 With over 30 years experience Walsh Pressure Cleaning gives your home and business peace of mind. Mention this ad and you’ll get a free DVD of your video inspection!